“When Sushila became pregnant, we hoped that we had a daughter. When we finally welcomed our baby girl, we knew our prayers were answered. 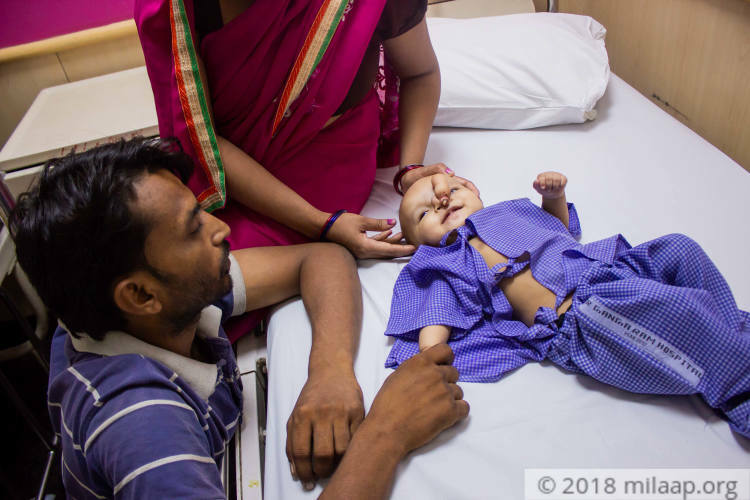 But now when I look at her become breathless even if she catches a small cold because of the growth on her nose, I feel she will be taken away from us before we have fully enjoyed parenthood,” Kundan, Shanti’s father. 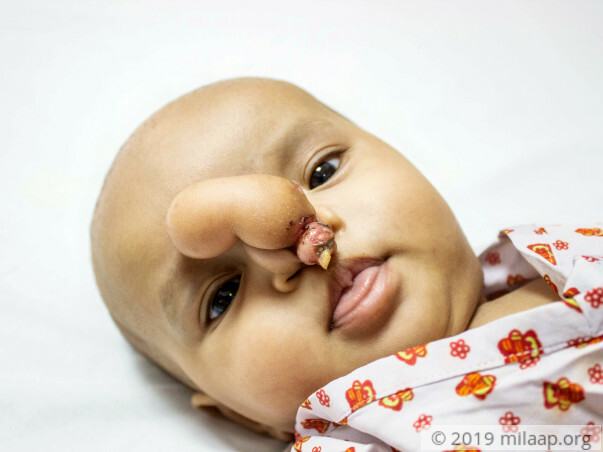 Shanti, the first-born and only child of Kundan and Sushila was born with some extra flesh in front of her nostrils. 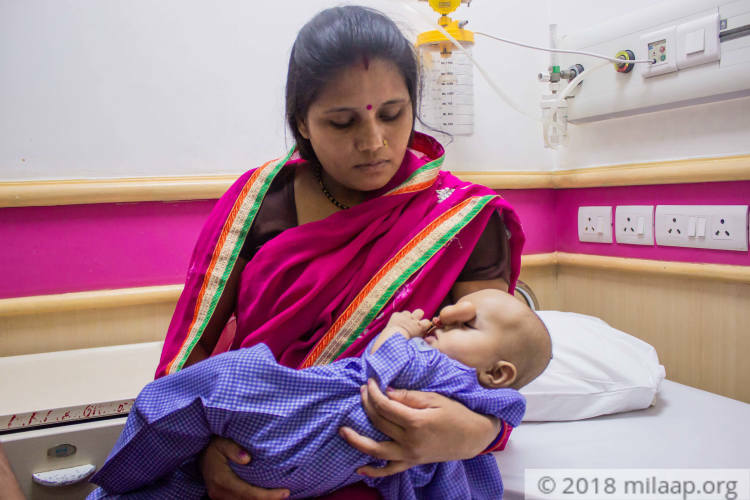 While Sushila was pregnant, the first-time parents were of the conviction that they were going to have a healthy baby. Little did they know that Shanti will barely be able to breathe once she is born. After Sushila’s 6th month of pregnancy, sometimes the baby in her womb seemed to move abnormally. The condition could be brought under control only after Sushila was given injections. Doctors never suspected any severe condition. Now, Shanti will not even make it without an urgent corrective surgery. If this is not done, she will stop breathing at any moment. Kundan packs things in a small ration shop in Delhi. He manages to earn Rs 9000 a month. Apart from his wife and baby, he has his parents and two younger siblings in Bihar dependant on him. He also has to pay the rent. Having a surgery for his baby is making things almost impossible for him. Being a mother for the first time, Sushila blames herself for her baby’s condition. She feels guilty of not being able to create a safe and pain-free life for her baby. It becomes difficult for Kundan to tell his wife that Shanti’s pain is none of their fault. The parents are desperate to save the life they have brought to the world. 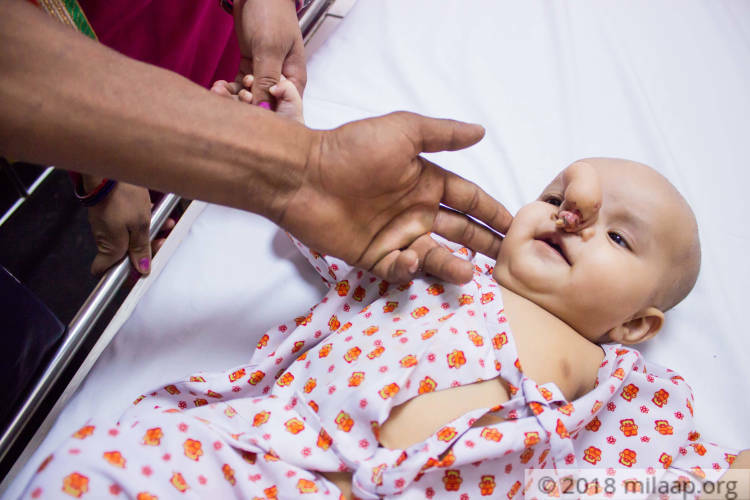 5-month-old Shanti has a rare deformity where extra flesh in front of her nostril doesn’t let her breathe. 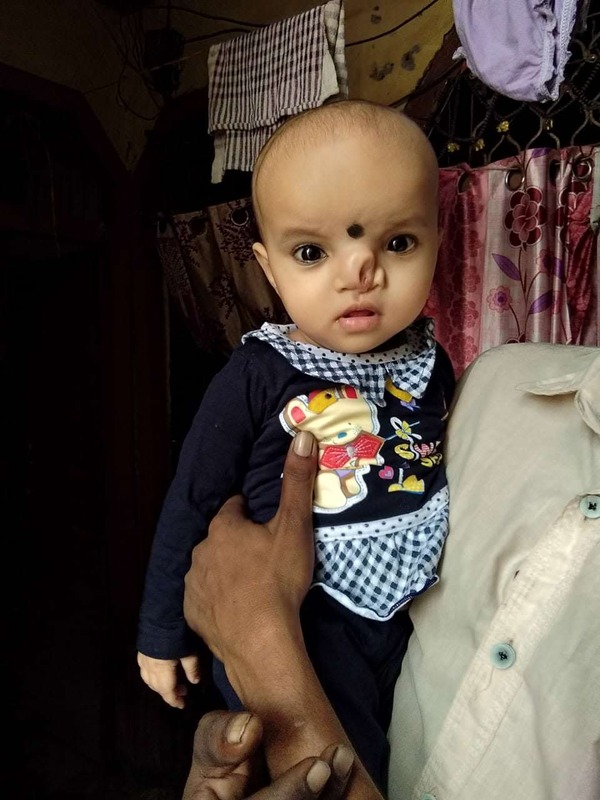 She needs an urgent, corrective, life-saving surgery which will cost the parents a whopping amount of Rs 5 lakhs. The first-time parents are desperate to save their baby girl. Shanthi is currently at home and is doing ok. Here's a recent photo of Shanthi. As we have informed in the last update, Shanthi has been discharged and is doing absolutely fine. She is on regular follow up with the hospital as well. 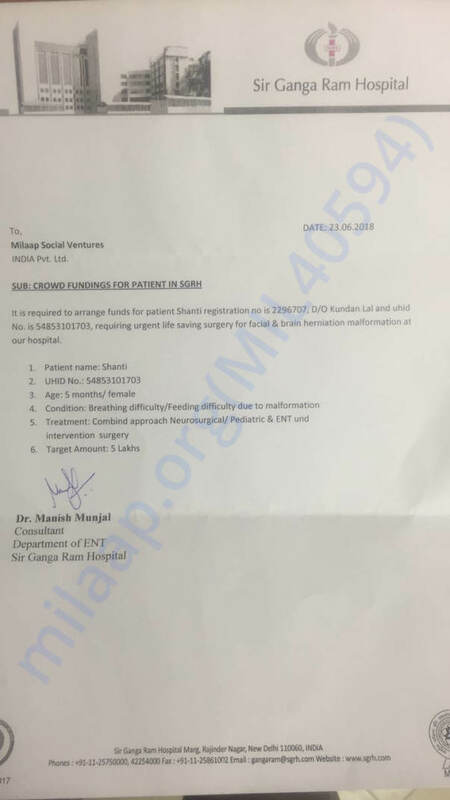 We have utilised whatever we have collected through donations through milaap but since the campaign has collected excess, we have decided to use the pending amount to Master Hardik's treatment. 3 year old Hardik is suffering acute renal failure and his family is seeking for financial assistance for his treatment. 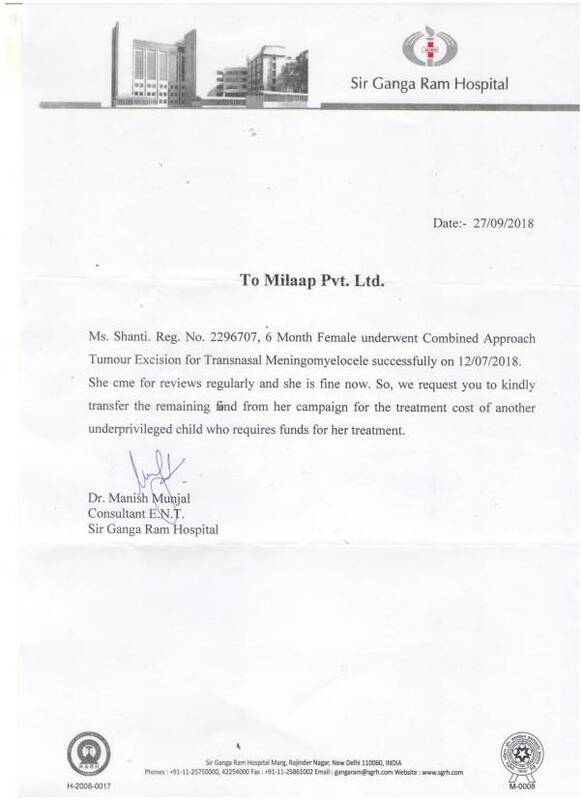 Once again Shanthi's family would like to thank all the donors who has supported her for her treatment from the bottom of their hearts, Without your support and prayers this wouldn't have been possible. We are happy to inform you that Shanti is discharged and doing well and is coming for regular follow ups to the hospital. We could not have done this without your support. Thank you once again.